Richmond Hill is a large suburban community in the York Region of Ontario. It is part of the Greater Toronto Area. 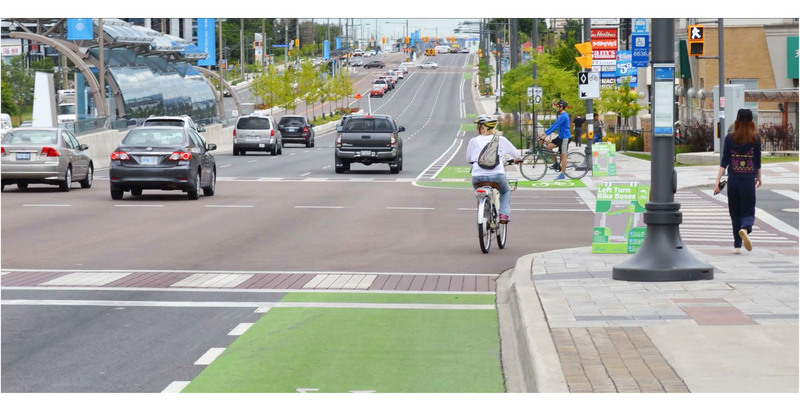 Highway 7 in Richmond Hill and Markham, Ontario was one of nine projects profiled in TCAT’s Complete Streets Transformations. Formerly a divided regional road oriented solely to motor vehicles, a complete redesign has brought bus rapid transit, bike lanes, and pedestrian improvements. Highway 7 connects the two municipalities of Richmond Hill and Markham, and increased intensification along this section created an enabling environment to support the rapid transit and active transportation expansions. The project cost $308 million to complete, and took five years (2005-2015), from the beginning of the design phase to the end of construction. Annual collision rates have been reduced from between 250 and 350 per year to 104 in 2015, the first full year after construction was completed. These numbers include collisions between motor vehicles, and between motor vehicles and cyclists or pedestrians. Transit ridership increased by 10%, and the average transit commute time was reduced by over 30%. Pedestrian counts performed at different points along the street in 2015 were up 61% compared to six years prior. The number of total annual cyclists at Valleymede and Hwy 7 (north side) was recorded at 16,000 for 2014.